The California gold rush produced some interesting and rare products that were contained in square glass bottles. Gin, various brands of schnapps and more than a handful of medicated, aromatic and other vague sounding alcohol based concoctions competed for their share of the California market. Did the companies that produced and sold these products understand or care what words they had blown in the containers that held their products? I, for one, think they probably did. They chose carefully what they had embossed in their bottles to entice consumers, that could read, into buying their product. For those potential customers that couldn’t read, horses, jockeys, animals and other attractive objects were blown into their glass bottles. I’m not an expert on 1850-60s’ marketing, but I do know a little about the California gold rush. During the beginning of the gold rush you could sell anything you could get to California. Not so true during the mid to late 1850’s. By the late 1850’s every liquor distributor on the east coast was “riding the elephant” and the California market was flooded with goods from the east. Just take a look at any late 1850’s California newspaper and count the advertisements for cases of liquor products being auctioned right off of the wharf that the supply ship was moored to. What this all boils down to is the competition was extremely fierce during the late 50s’ and early 60s’. Liquor distributors had to use their wits to compete in an over supplied market. “Medicated Gin”, “Aromatic Schnapps” and “Club House Gin” were but a few of the products that were being pushed on the buying public. 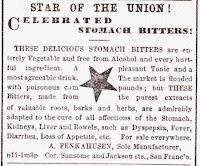 The advertisements for these products claimed to cure as many ailments as the patent medicines of the period. Oh, and by the way, they tasted better and left you feeling tipsy if not downright comatose. Ever wonder what these early gold rush squares contained? I certainly have. Two of the foremost products were Gin and Schnapps. Gin - we all know that gin is a strong colorless alcoholic beverage made by distilling or redistilling rye or other grain spirits. There were dozens of varieties of gin and each agent c laimed theirs was the best tasting, most medicinal or had the greatest healing properties. London Gin is your basic run of the mill dry tasting gin and usually doesn’t have any flavorings or spices added. Old Tom Gin is a lightly sweetened gin that was very popular back in the day. Dutch or Holland gin was typically distilled from Juniper berries and had a distinctive aroma and flavor. And then there’s the medicated gin (containing some sort of medicine), Cordial Gin (a stimulating and invigorating concoction), Clubhouse (high class belonging to a club) kind of gin and it goes on and on. Schnapps, on the other hand, is a Dutch spirit distilled from potatoes and sometimes other grains. Schnapps was possibly the first widely distributed liquor based product during the gold rush. We find scads of them in the early gold rush camps and towns here in California, and like the gins, there were dozens of different brands and types. Udolpho Wolfe’s Aromatic Schnapps, the most common of schnapps found here in California, was a distilled spirit f lavored with spices to give it a pleasing aroma and flavor. Voldner’s Aromatic Schiedam Schnapps was distilled from juniper berries, and as such, had a very different aromatic flavor. The word Schiedam refers to not only to the city in Holland but to a particular type of schnapps. The recipe for Schiedam schnapps varied by manufacturer but almost always included the addition of honey, nutmeg and orange flower water to give it that “aromatic” flavor. Yummy! Schnapps was always advertised as a medicinal product and recommended for family consumption. These early western distributed square bottles are becoming harder to acquire and in greater demand by western bottle and gold rush memorabilia collectors. 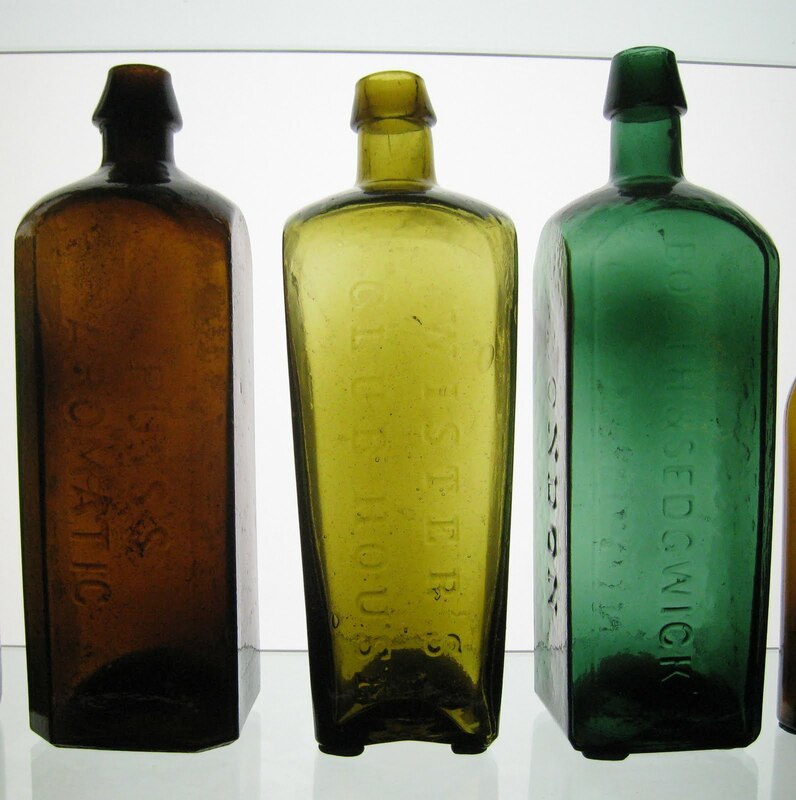 Clubhouse gins, aromatic schnapps, or one of the dozens of colorful embossed or un-embossed square glass containers, that made their way to California during the middle of the 19th century are a very collectable part of early California history.
" 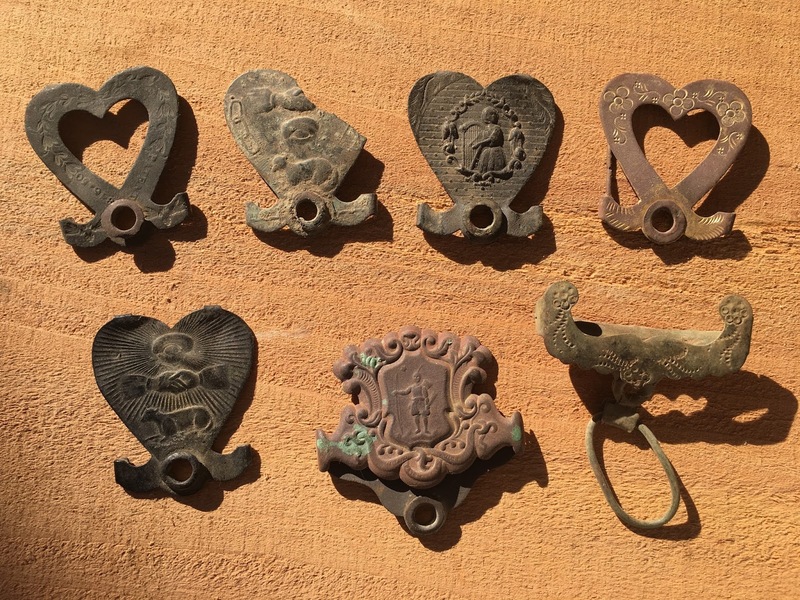 Wanted any 1850s heart shaped suspender buckles or examples with a rivet on the bottom " . In 1836, Juan Alvarado vowed to gain increased autonomy for California from Mexican rule with either "bullets or words." 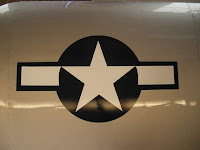 He hoisted this white flag with a single, centered, red five-pointed star at Monterey. In 1834, Alvarado had been elected to the Alta California Legislature as a delegate and appointed customs inspector in Monterey. The Mexican government had then appointed Lieutenant Colonel Nicolas Guterrez as Governor against the wishes of the legislature. In November of 1836, Alvarado and Jose Castro (with Vallejo's political support) surrounded the presidio at Monterey and forced Guterrez to surrender power to them. At the time of Alvarado's revolt, he still favored remaining a part of Mexico, and working with the Mexican government. With Vallejo's political support, he went on to become a two-time Governor of Alta California from 1836-1837, and later between 1842-1845. 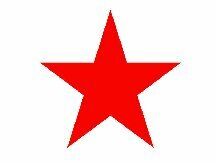 The red star signifies freedom and independence from Mexico. The original flag is preserved at the Autry National Center in Pasadena, Cal. It is the oldest surviving California flag. This is how the five pointed western star began in California. Some of these mystery's are major, some minor. Take for instance the "Western R". Now here's a major mystery. When did the Western curved "R" first appear on western bottles? Is this "R"unique to one particular glass house or did both the SFGW and PGW use the curved "R"? Is this "R" from just one mold maker or was it used by several different craftsmen over a span of years? And just when did they quit using this "Western R"? This, for sure, is a mystery that I have tried to solve for a long time. Every time I think I am getting close to a conclusion another piece of information sends me off in another direction, or backward, and brings more questions than answers. The STAR Of THE UNION star is a exact match to the earlier gold rush buckle star. Crisp, sharp points and canted. Dale claims that the square bottle with a star and TM embossed on it could quite possibly be a western blown bottle. 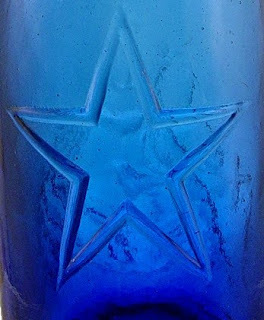 Dale's contention is that several western merchants have a star prominently displayed or embossed in the glass of their product. That is correct but the star on the bottle is not canted like the star on the advertisement. After a quick trip to Marysville for a Carls Jr. burger I noticed the star on the burger wrapper didn't look anything like our (so-called) western star, its points were rounded and it had a smiley face on it. 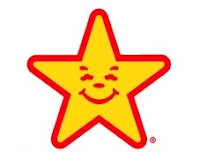 We can eliminate Carl's Jr.'s star as being modeled after the Star of the Union Bitters star. Just look at a military star it means business, not bitters!